The Yes Movement was in full swing as its goat faced troll of a leader made his way down to the ring to open the evening. Dressed in his ring gear the WWE Universe had no doubt that the fired up farm animal had come to fight. And basically that is exactly what Daniel Bryan told Byron Saxton when questioned. He was there to win his return match against former Hell No team mate Kane, he had every intention of winning the Royal Rumble on Jan. 25th, and then he planned to have lightning strike the same place twice and win the World Heavy Weight Title at Wrestlemania! The brainwashed masses ate up. Thankfully, the united front of the Authority rescued the faithful few who have bought in (such as myself) from witnessing too much more Daniel Bryan’s self-aggrandizing as they accompanied the Corporate Demon, Kane, to the ring. 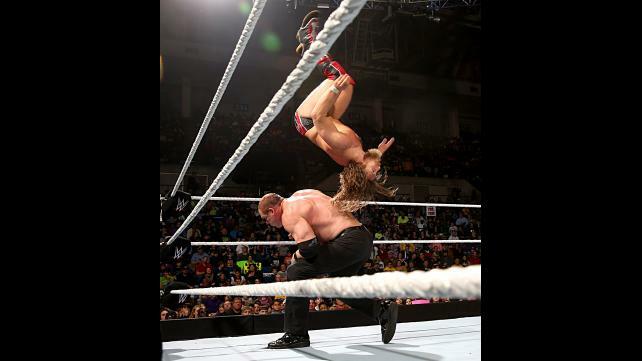 The question everyone in the WWE Universe had was, how would Daniel Bryan fair in his first in action in 8 months? It got its answer as soon as the bell rang to begin bout. Bryan exploded and made sure we all knew he was ready with a vicious drop kick to Kane that threw the Director of Operations off his game plan. Bryan showed no signs of ring rust as he continued to take the fight directly to the near 7ft monster. But, being the B+ player that he is, Daniel was not able to keep up the momentum as Kane began to take control and target the neck of his bearded opponent. Luck however, appeared to be on the leader of the Yes Movement’s side as he was able to use his speed and high risk offense to get the Demon reeling once again. The match appeared to be in jeopardy for Kane as Daniel Bryan locked in the Yes Lock, but J & J Security pounced on Bryan forcing the disqualification that would give the win to the bearded troll. The valiant members of the Authority joined the security team to give Bryan a proper welcome back to in ring action, but the ungrateful goat fled the party and scurried up the ramp. Not willing to let their plans be ruined by one bad sport, Seth Rollins, The Big Show, Kane, Jamie Noble, and Joey Mercury began to pursue Daniel up the ramp. But the appearance of Roman Reigns and Dean Ambrose sticking their nose into business that was of no concern to them stopped the Authority boys in their tracks. Triple H, seeing an opportunity to do what was best for business (because he knows that sorta thing,) made the main event a 6 man tag match of Daniel Bryan, Dean Ambrose, and Roman Reigns vs Seth Rollins, Kane, and the Big Show! What a way to return to the WWE Universe. I will give credit where credit is due, Daniel Bryan was on fire and if you hadn’t known he wasn’t in action for 8 months, you still wouldn’t have known by watching him in this match. He was completely at home in the ring (prolly because it loosely resembles a pen that goats stay in <.< ) and showed why he was at the top of his game before his ill timed injury. His energy is infectious and you can tell he has a passion for this business that bleeds into his in ring work. Kane was a perfect opponent. Their history together made the in ring story compelling and the end of the match didn’t feel like a cheat. This was a brilliant appetizer to the main course of the main event to come. Unfortunately, this match was same ol same ol. Back and forth action that was neither memorable or too terribly exciting. It was a decent pace that kept it moving along but the best part of the match was Damien Mizdow being used as a stunt double and taking a Super Kick that was intended for the Miz that allowed the Hollywood A Lister to catch Jimmy Uso with a Skull Crushing Finale for the pin fall victory. 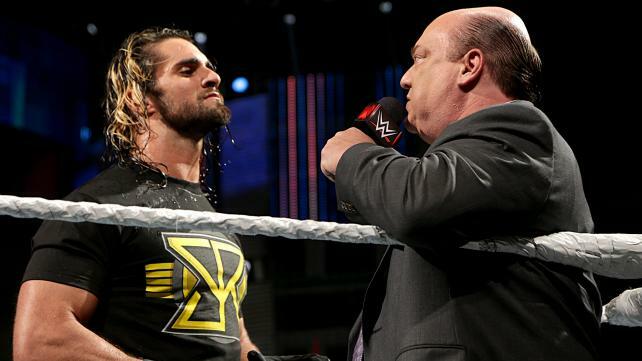 After his client received a curb stomp that shook the WWE Universe to its foundations, Paul Heyman had a few choice words directed at the living embodiment of the future, Seth Rollins. Mr. Money in the Bank, never one to leave a challenge unanswered joined the Father of Extreme in the ring. Seth was incensed that people whispered about him being a coward or that he hid behind J & J Security (which is incredibly stupid as I’ve explained before. He works with the tools at his disposal to achieve his goals.) He told Paul he was sick of it, and that he was cashing in the Money in the Bank contract right then and there. Paul then reminded Rollins that the World Heavy Weight Champion, Brock Lesnar, was not in the building. Seth would not be denied. He cornered Paul in the corner of the ring and said that since Brock was not around to be curb stomped, that he would then curb stomp the advocate of the Beast. Heyman, attempted to use his gift of gab to shame Rollins into releasing him stating that his plan to curb stomp him was unoriginal and over used. That is when my hero, Seth Rollins lived up to his title of the Architect, as he let us into his thinking process as he detailed exactly what curb stomping would do. By removing the brains, Seth would only be facing brawn and pure muscle is something he could beat easily. Paul Heyman seemed to consider this, but as always his sense of self preservation and his ability to see what we could not won the evening. He advised Seth that everyday, he gained power. The Authority, while in power now, had been ousted before and could be ousted again. With the power that Paul has accumulated, and the death grip that Brock has on the championship, that he can control that power by defending the championship, or he can protect the champion when Paul decides the future is now. This seemed to strike a chord with Mr. Money in the Bank as he backed off and Paul Heyman left him to his thoughts. The Diva’s Champion, Nikki Bella was set to take on the Queen of Harts, Natalya. Nikki was of course accompanied by twin sister Brie, and Natalya was only accompanied by Paige (no Tyson Kidd in Nattie’s corner meant that this match had a chance of being decent. Those two are like each other’s kryptonite.) It was a fun little match of back and forth action but Nattie held the offensive momentum for most of the match fighting off the Champions attempts to turn the tables on her. Not even Brie’s attempted distraction was enough to knock Nattie off her game as she was able to lock in the Sharpshooter and pick up a huge win over the Diva’s Champion solidifying her as a contender for the title. This was a surprise gem of a Diva’s match. Not up to NXT Women’s competition standards (yes, I’m biased and extremely spoiled) it was still a decent match. I’m shocked too because it involved a Bella! I’m beginning to think the blue lights of Smackdown make the Divas better wrestlers because this is the second week in a row I wasn’t bored to tears but actually entertained by a Divas match. And of course apart of me sees Paige in this because she wants the title for herself. But, Angelic Heel, how’s that work if she is helping Nattie get it? Well let me tell you. Paige is notorious for her love of the Diva’s title and for turning on her friends. Nattie beats Nikki at Royal Rumble for the title. Paige then starts to come after Natalya after positioning herself close to the new champion. It’s not that hard to piece together. After an upset victory over Bad News Barrett, Sin Cara found himself with a championship opportunity. But BNB was not so willing to let the title go and was out to prove that their previous encounter was simply a fluke. That isn’t to say Sin Cara was steam rolled. Oh no, that jumping bean fought hard and surprised us even more with his high flying skills and strength, at one time lifting Barrett straight off the mat into a wicked slam that rattled the champions teeth. But as valiant an effort it was, it simply was not enough to win the Intercontinental Title. Barrett pinned the luchadore while he was catching a siesta from the Bull Hammer Elbow that was delivered to him in mid flight. This was a dark horse of a fun match in that I didn’t see it being that fun till I was cheering on my fav Brit to take out the high flier. Something about Barrett’s brawler style just intrigues me, and to see it paired against the unpredictable high risk style that Sin Cara is known for is really a beautiful thing. Don’t know why I’m surprised though, Sin Cara is one half of the NXT Tag Champions. That alone means he’s stupidly talented (NXT! NXT! NXT!). Perhaps on paper it’s difficult for me to see their two styles meshing as beautifully as they do, but together, this match was both entertaining as Barrett was kept on his toes trying to catch the high flier. I almost wanted someone to run out with a butterfly net for the big Brit. But he had everything well in hand as he successfully defended the title. Now… Who is next in line to try and take BNB’s title? Triple H always knows what’s best for business, and it was again solidified when his 6 man tag team match main event came to pass. This match was filled with everything one could hope for in a match. It was intense and chaotic and the only times the action slowed were when the Big Show was in the ring (surprise surprise >.>). But that being said, his presence did not detract from the match but allowed the WWE Universe a chance to catch our breath as we watched the insanity that this match degenerated into. Neither team could claim to have fully dominated the other as it was a back and forth struggle that kept one holding one’s breath no matter which side you were going for. There is so much of a story told in this one match that all of the wrestlers (save Big Show, why is he even here? really…) impressed me. Daniel Bryan ended up picking up the win on Kane for his team after Dean Ambrose neutralized the the Authority team with a flying elbow to the outside. But Triple H, always knowing what is best for business, came out during the victory celebration and made another match for Raw. Daniel Bryan vs Kane. 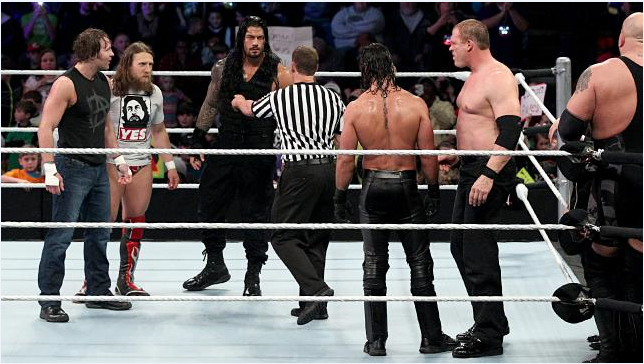 If Bryan did not win, he lost his spot in the Royal Rumble. How’s that for motivation? Isn’t it nice how the Authority always finds ways of making the people that work for them better by making them work for what they really want? I enjoyed this match immensely. It was one of those matches were you couldn’t help but cheer for everyone involved (except Big Show, unless you are into 7ft charisma vacuums.) Daniel Bryan is so exciting to watch in the ring, and pair him with Roman Reigns and Dean Ambrose, two mean who are also magnetic and fun to watch. And then make them in a match against Seth Rollins? Don’t care who his partners are (cuz oops I think I accidentally put my boy in a face’s dream handicap match <.< I’M SORRY SETH!!!) he will shine no matter. Seth against any of those three is instant gold and I gotta say, I want to see more Farm Animal against the Savior of WWE. Their chemistry is off the chart. Of course, then WWE would prolly get PETA called on them for animal cruelty considering the abuse Rollins would inflict on goat boy. This entry was posted on Friday, January 16th, 2015 at 6:38 pm	and is filed under Events, News, Television. You can follow any responses to this entry through the RSS 2.0 feed. You can skip to the end and leave a response. Pinging is currently not allowed. « Film Review: ‘The Wedding Ringer’! !